The British Association of Removers, and a few of its Members, including Bray & Son Removals, Fox Moving and Storage and Specialised Movers, celebrated on June 4th Her Majesty The Queen’s Diamond Jubilee at the Surrey County Show, in Guildford, where they exhibited for the first time a unique collection of impressive vintage removals vehicles, ranging from horse drawn pantechnicons and vintage commercial vans, to early-modern removal vehicles, that were used by BAR Members. 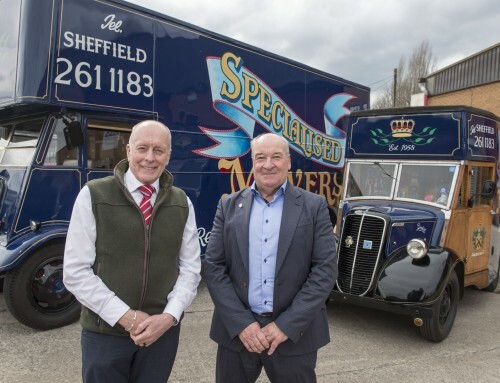 This exhibition was a fantastic opportunity for any vehicle and history enthusiast to take a trip back to the good old days ofmotoring to see how removal vehicles evolved from 1890 through to 1971. The British Association of Removals and its Members were absolutely delighted to be invited to attend this show to display their historic vintage vehicles for the pleasure of every generation. With over 500 stands at the Show, the very special visit of HRH The Earl and Countess of Wessex, and a wide range of demonstrations and exhibitions, the biggest agricultural show in the UK attracted about 40,000 visitors, and the BAR display received a ‘spectacular foot fall’ said Director-General Stephen Vickers. It was for every BAR Member that participated and exhibited their vehicles at the Show a fantastic opportunity to promote themselves to the public and meet their potential customers of the future. The BAR and all Members present got a huge amount of publicity as their vehicles received ½ page promotionin the County Show programme, and were displayed and presented twice in the Grand Arena as part of one of the main attractions receiving excellent media coverage, as there was real interest in this very niche display, open to the public for the first time. Local reporters to the BBC Surrey Radio also did a special feature about the display and interviewed BAR Director General Stephen Vickers and ex-BAR President Paul Fox. It was a ‘great opportunity to display our history and heritage as a trade association and as an industry’ said Paul to the BBC. The British Association of Removers would like to thanks its Members for their support, without which this kind of exhibition would not possible, and following this year’s success we hope to be able to provide our Members with more free opportunities to promote their business in the future, and to see more of our Members participating in these kind of events, as this is definitely the type of events not to miss for any company who want to increase their public profile.